Incredibly enough on precisely the second occasion that humans ever flew, they went up drinking. It was December 1, 1783, and as a crowd containing King Louis XVI of France and Benjamin Franklin watched, the physicist Jacques Charles handed his fellow aeronaut Nicholas-Louis Robert a glass just a moment before liftoff. As the ropes were let go and the balloon began to rise, Charles popped the cork on a bottle of Champagne, filled their glasses, and together they toasted the crowd and the miracle of flight. That had a certain quality of…savoir faire. Style. Panache. And in fact the food eaten aloft after that second flight abounded with style, panache, savoir faire, and oftentimes savor as well. It was often–no, typically–eaten in tremendous quantities. Nice groceries, and lots of them: that could have been the motto of eating in the air. 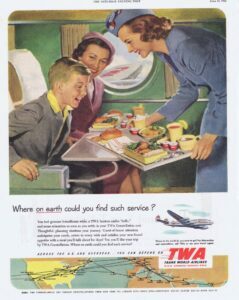 Needless to say, when most of us travel this summer, that won’t be the motto of our airline’s dining service. We feel very fortunate to get peanuts and a soda. So what exactly happened? 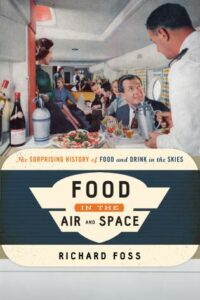 • Richard Foss’s website devoted to “food in air and space”.